Water resources engineer Niels Riegels from DHI in Denmark is one of the scientists who participated in developing the tool. Niels, what are the benefits of using it? The ESS tool provides a systematic approach to identifying, measuring, and valuing Ecosystem Services. It also is capable of measuring changes in ESS resulting from new policies or solutions, which makes the tool useful for cost-benefit analyses or other assessment exercises. Furthermore, the tool provides guidance for implementing the DESSIN sustainability assessment, which gives a broader perspective on proposed policies, projects and solutions. The main target audience for the tool are scientists and planners who provide information and advice to decision makers. Technological service providers may also be interested in using the tool for marketing if their services are thought to have positive impacts on ESS. What are the requirements for using the tool? The ESS tool requires basic familiarity with Windows software. No specialized software skills are required. However, the tool can be extended to estimate indicator values, including economic values, by scientists and engineers familiar with modelling and programming. The software tool is part of the MIKE Workbench software, which is used to work with simulation models, data, and maps. To use the DESSIN tool, you need to install this software first. Some optional features of MIKE Workbench can be used to extend the tool to link to model results. These are not available for free though and require a license but the basic tool is free of charge. 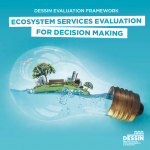 Download links and instructions for the Ecosystem Services Evaluation software tool and the user guide are available here.